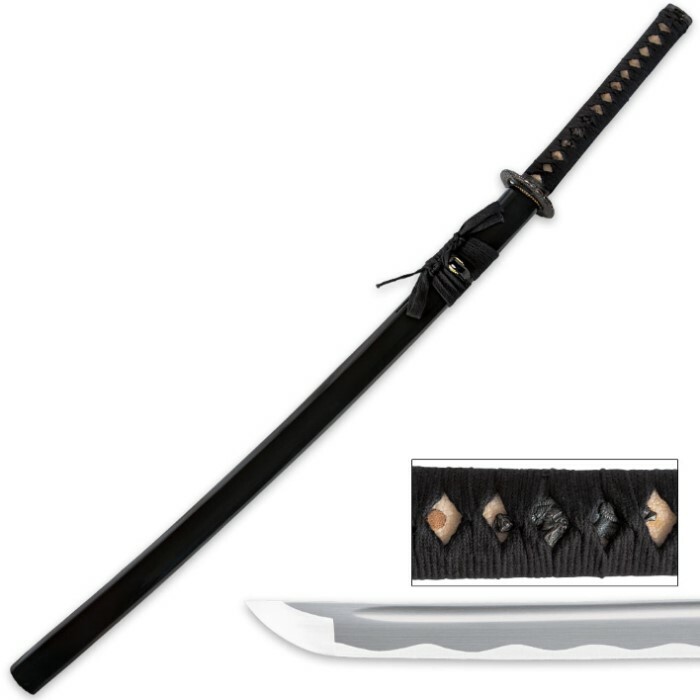 Dragon Warrior Samurai Katana With Scabbard | BUDK.com - Knives & Swords At The Lowest Prices! Email me when in stock! This dragon warrior is ready for action, featuring a 27-1/2" high carbon steel blade complete with a traditional fuller groove. It comes to you sharp right out of the box. The copper-tone tsuba features a warring dragon motif for tons of style. Other traditional elements include a brass habaki blade sleeve matching menuki and kashira. The handle is encased in faux ray skin and wrapped in decorative cords. A hand-painted scabbard houses the blade. This sword was so cheap as to almost be a giveaway, so I bought it not knowing what to expect. I don't even know if it is full tang or rat tail tang or what. Therefore I don't dare go swinging it around for fear that the blade may come lose from the handle. I wish Bud K would specify the nature of the tang as well as who made the sword. The sword itself looks real good and is tight, with no rattles. The edge of the blade is amazing. It is the sharpest blade I have ever seen on anything including razors. If you just look at it you are cut. If you just think about it you may be cut. Astounding sharpness! A great bargain for the price. I am thoroughly happy with it. Great sword, solid no rattles, nice blade pretty sharp out of box only took a couple light hone strokes to perfect for a sword. Definielt a sword anyone would love. first of all, TS has the best customer service people in the world. Very polite, professional, and hard working. NO complaints about them. TS delivers lightning fast. sword is awesome. sharp out of the box. have one for my 3 kids, with their names engraved on them. working on one for each of my 3 grandkids. highly recommend this sword. 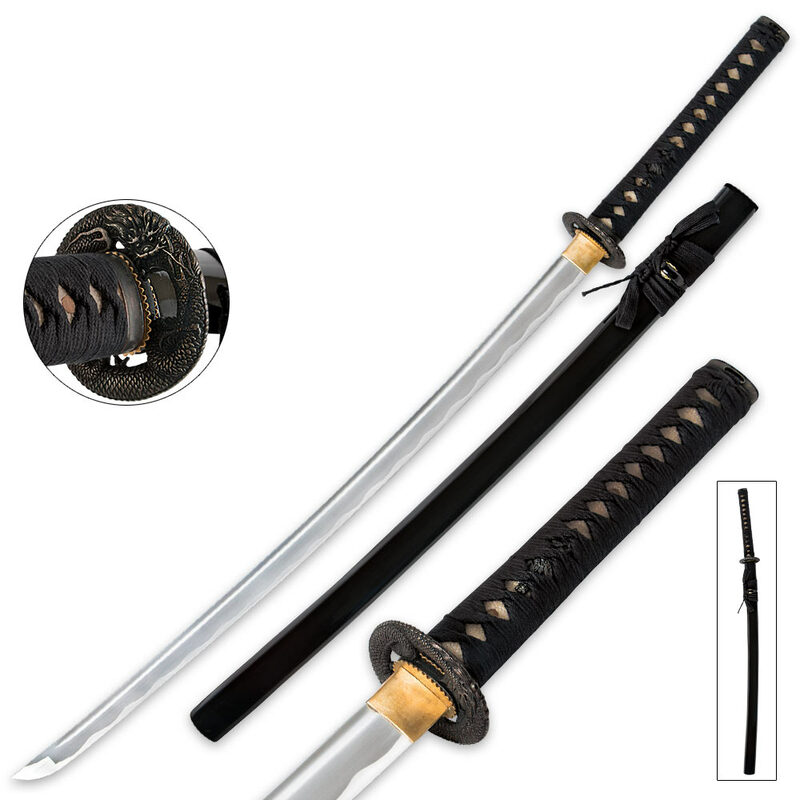 I ordered this sword, and was very excited to get it, as it was my first katana. However it was a bit disappointing, as there were a couple of faults. First of all, I had chosen express 3 day shipping, and it took 5 days for it to ship, because apparently the processing took 2 days, and I though that 3 day shipping was the overall, not just from FedEx to my house. The second thing that I was disappointed in was the fact that the blade was pretty dull. I tested the blade out on various things, and it wasn't even able to cut paper without me putting a good amount of force. All in all the katana as a whole is decent for its price, and I think I just got unlucky, and I ordered a sharpening stone to see if that will help me at all with the sharpness. 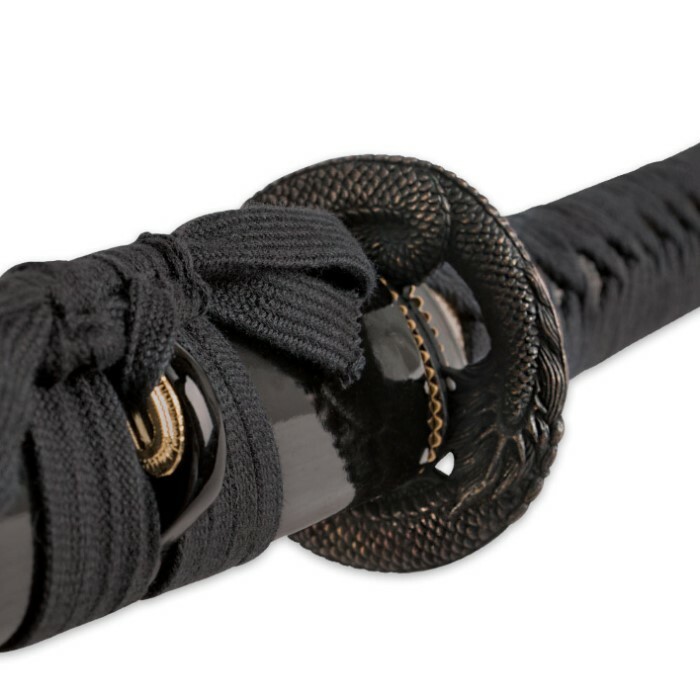 I ordered this sword for a long time friend & student who's recently new to Samurai swords and he has been extremely happy with it. It's a great quality, beautiful sword that's great for beginners or long time collectors. Nothing loose; arrived sharp; and has a great feel to it. this sword is great. Sharp blade, full tang, and very beautiful. i liked it so much i bought three of these. and had my kids' name put on each one. kind of an heirloom thing. starting one anyway. TS had these swords to me at the same time i ordered another sword two days earlier. talk about lightning fast delivery. highly recommend this sword. it is an outstanding sword for this price. might have to purchase some more of these with the grand kids' names. Very good value. Looks as described, sturdy construction and beautiful design. Overall, I am glad I bought this sword. Recommend.